generic viagra For now I’m going to concentrate on the Peregrine Falcon, since it is probably the most well-known. This is largely because it has an incredibly large range – one of the largest distributions of any bird. The name “peregrine” means “Wanderer.” This small raptor is found on every continent of the world except Antarctica. As the name implies, it will often migrate for incredibly long distances. order now So, some of the important Falcon keywords are Vision (especially Higher Vision) and Focus. This makes Falcon an excellent life’s purpose totem. If Falcon appears to you, take note of any shift you may be experiencing in your life. Its appearance may be pointing the way for you towards following your dharma (harmonizing your life with your higher self.) Respect your deepest intuitions regarding which way Falcon is pointing you to go. viagra buy now Falcon teaches us to choose our life’s goals wisely, to go with the flow in pursuing them, and to avoid distractions that may keep us from pursuing them effectively. Fortunately, Peregrine Falcon populations are now rebounding due to recovery efforts including pesticide bans and breeding and reintroduction programs. This magnificent bird is once again a common sight. click here I believe that its comeback mirrors a major shift in planetary consciousness, in which humanity is beginning to recognize and honor its higher spiritual purpose. Because our new hound dog, Melvin, has not come howling up with a stinger in his nose, I am guessing that my recent bee visitor is gone for good. However, she did bring an invigorating infusion of Bee energy into the studio. It’s quite the buzz! I’ve been playing with the idea of the Bee as symbol for the Power Center, or solar plexus chakra, and have been wanting to get it down as a painting. Today seemed like the day to do it. The Power Center grooves on yellow and gold – fitting, because gold also represents money, power in its abstract. This is probably why so many spiritually conscious people have issues with their Power Center. It’s easy to look at the way power is abused in the world and not want a thing to do with it. But really, that’s kind of a backwards way to look at it. https://stetsonpainting.com/whychooseus/ buy now Abuse of power – whether you are the abuser or the abused – is simply a symptom of imbalance of personal power. NOT claiming your true inner power will not fix it. Of course, money is optional where true power is concerned. It’s just one way in which power expresses itself. It also happens to be extremely convenient, so why not be open to manifesting it when appropriate? Being well funded can certainly help you live your dreams. Which, if your Power Center is well-balanced, shouldn’t lead to abuse. And, if your heart is in the right place, it will likely bring good fortune to others as well. Somewhere in the middle of painting this piece I began to feel something else was needed. The bee was taking form nicely atop the cells of golden honeycomb, but it just seemed…ungrounded. It seemed like it needed something to tie it together. 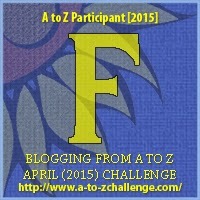 Perhaps an oval shape framing the bee? No, that wasn’t quite it. Then I held my hands in a heart shape over the bee. Ahhh. That felt right. And a bit of pinky purple was just right to balance out all that yellow. True power is centered in the heart! For more information about Bee in your Heart, click here. A magical thing happened in the studio yesterday. And it had nothing to do with paint. 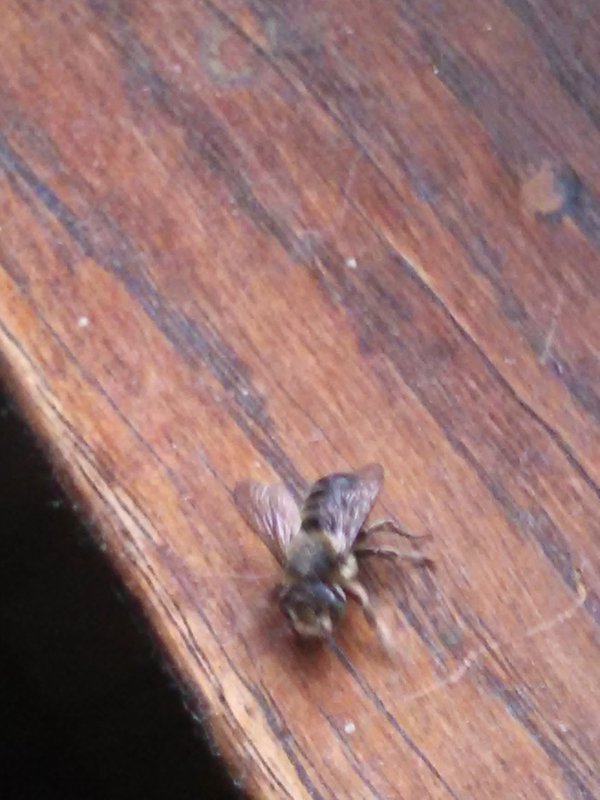 A honeybee, I think. Of all the odd things to show up in January, in the middle of a big old building in the U.P. of Michgan. I stooped down and set my finger down in front of her. She climbed on readily. Up close, I could see each joint of her six legs, shiny black like her oval eyes. 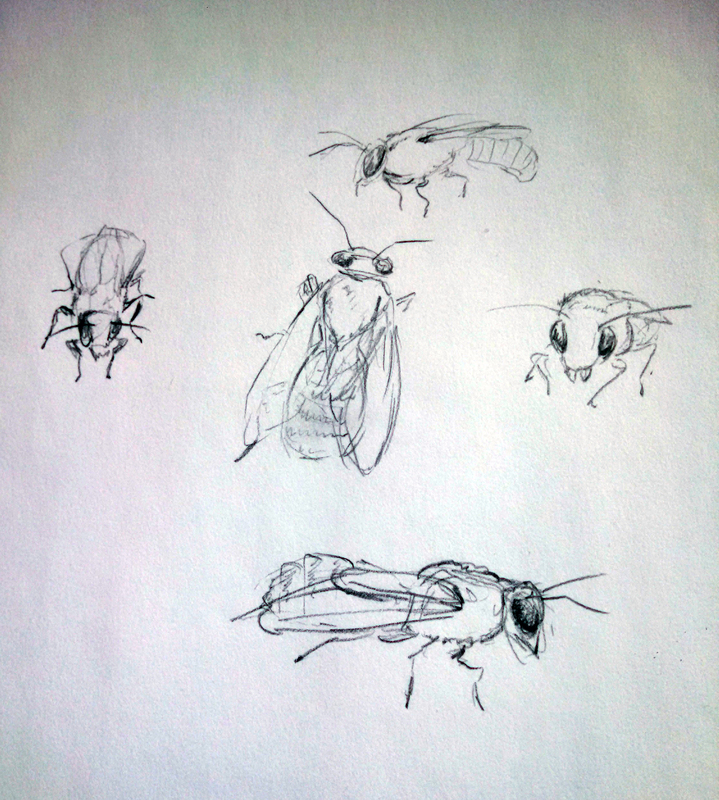 Two sets of transparent wings jutted sleekly from her fuzzy thorax. Her segmented abdomen throbbed rhythmically as she paused, tasting my skin, then ceased as she continued her slow march along my finger. She looked weary, emaciated. I suddenly needed reassurance that I could get her off if need be, so I placed the bristle end of my Chinese brush in her path. It was still wet. I thought she might not like that, but she climbed on obligingly. Then, delicately, she lowered her proboscis to the wet bristles and began to drink. 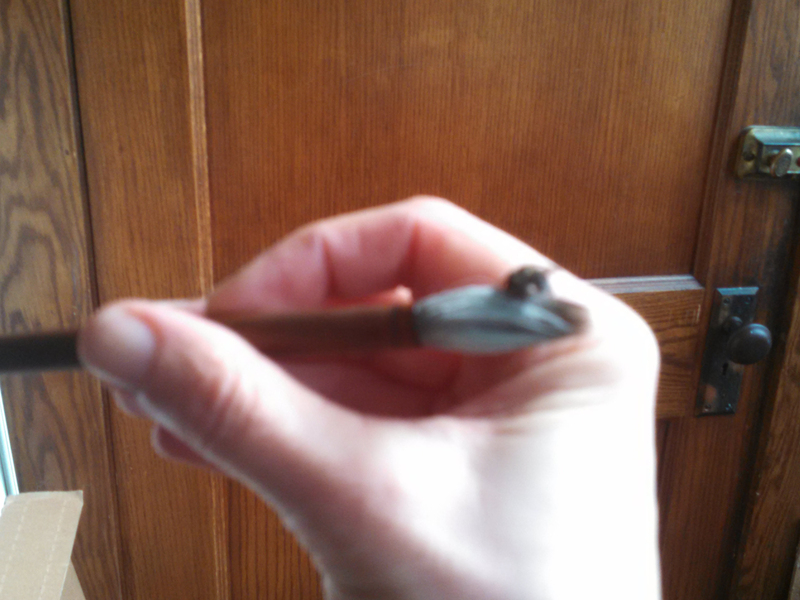 This photo is as fuzzy as the bee herself, but you should be able to make out my little bee on the brush bristles. Who knows how long it had been since she had had water? She drank and drank, and I began to wonder if she might be hungry, too. I carried her slowly to the kitchen, fetched a chopstick from the drawer and extracted a drop of honey from the jar on the shelf. Yes, she was hungry. She ate purposefully. While she ate and drank, I tried to capture her image. My phone camera rebelled against focusing on such a small object, but alas, the other camera’s battery was dead. I shifted the brush to my left hand and drew a series of quick sketches from multiple angles. 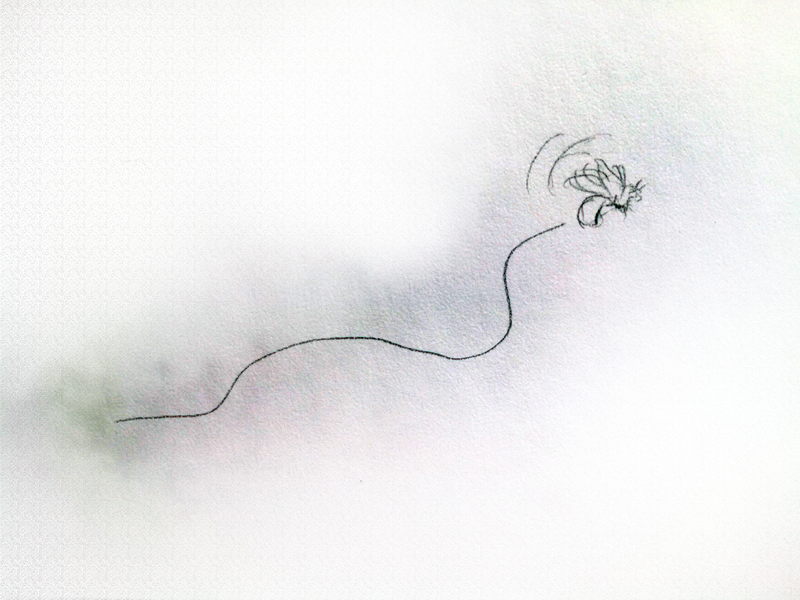 As I drew, I realized that this bee brought the answer to a question I had recently sent out to the universe. In fact, she was the answer! When the bee had had her fill she retreated to the end of the bristles and washed her face and legs. Wanting to get back to my task, I set her, brush and all, amongst the leaves of my plant. A single bee in the middle of winter is not likely to live long. 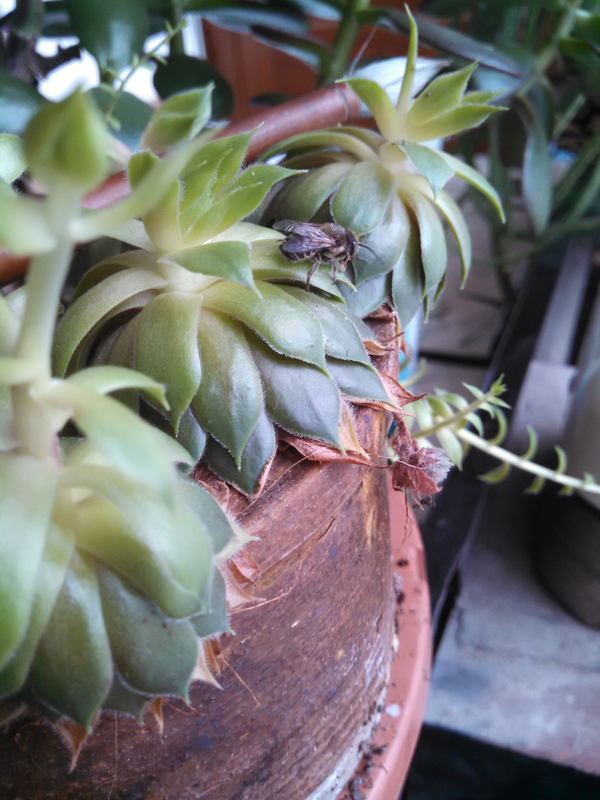 I figured she would probably never fly again, but she might enjoy feeling living leaves under her little feet. I finished halving the sheet, but instead of starting the painting I’m planning to use it for, I was drawn again to check on the bee. I watched her struggle up a slippery leaf. She slipped back, regained her footing, then slipped again, tumbling to the windowsill below. Then, in a moment, she launched into flight. 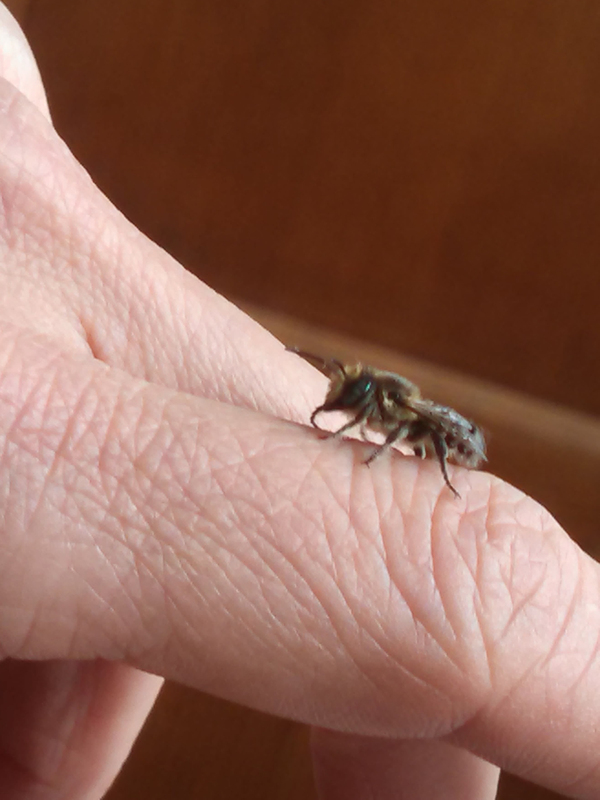 My bee circled once about my head, then, suddenly, she was gone. But what a gift she had brought! And I wonder…how many other spirit messengers have come into my life, and I never knew it, because I didn’t take the time to listen? 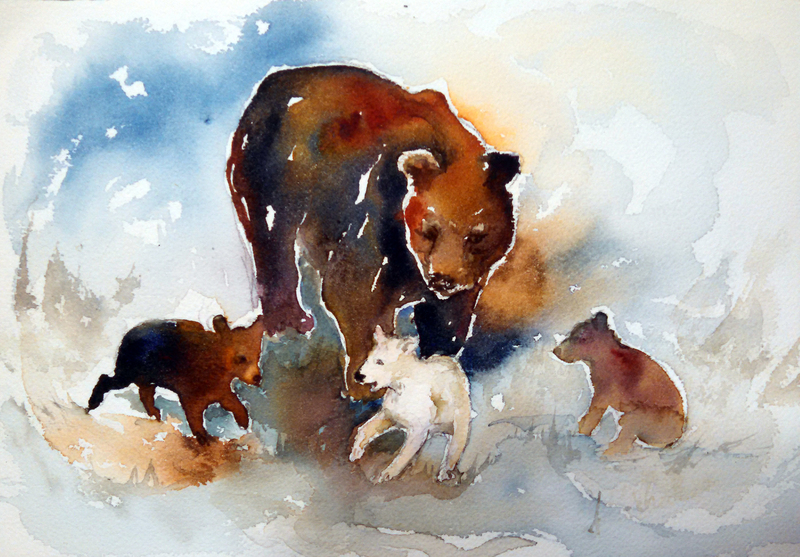 Black bears come in many different colors, from black to all shades of brown, even creamy white. Non-albino white black bears are found almost exclusively in British Columbia and are also known as “Spirit Bears.” In Native American legend, the white color of these bears is said to be a reminder of past ice ages. The white bears are also said to stand for harmony and peace. Last summer on a car trip through northern Wisconsin I happened to look out the window in time to see a mother black bear with her three cubs. What a thrill! The ones I saw were actually black, or nearly so, but black bears come in many different colors, from black to all shades of brown, even creamy white. Non-albino white black bears are found almost exclusively in British Columbia and are also known as “Spirit Bears.” In Native American legend, the white color of these bears is said to be a reminder of past ice ages. The white bears are also said to stand for harmony and peace. We don’t have spirit bears where I live in the U.P. of Michigan, but somehow the little cub in the center just wanted to be white. Its playful expression is perhaps a reminder that we need a little fun in our lives now and then in order to maintain harmony and peace in our lives! My dad seems to have bear energy. 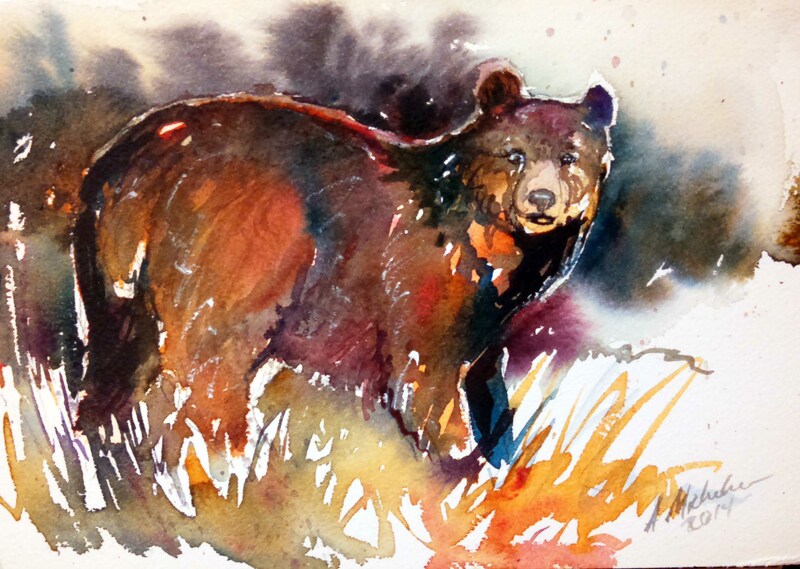 I’m staying at his house for a few days and keep wanting to paint bears. I used a very limited primary color palette for these, and did most of my color mixing on the paper. I have started a third, of a sow bear with cubs. It’s still in progress, but will post when done! 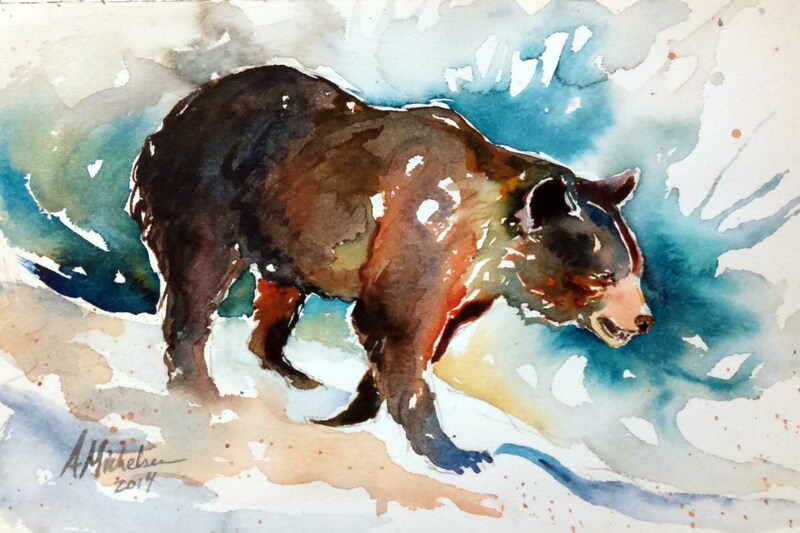 Author AnnePosted on November 5, 2014 Categories Animal art, Animal spirits, PaintingsTags animal, art, bear, bears, painting, Paintings, sketch, Watercolor4 Comments on Bears!